… is already giving me a headache. 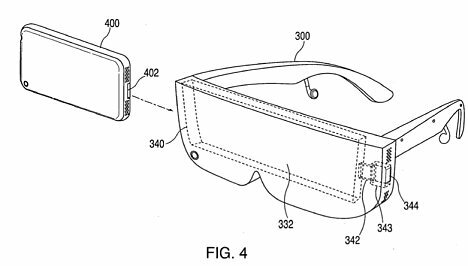 The conceit behind the patent app is a pair of glasses you attach an iPhone, iPod or similar Apple device to watch video in high-def equivalent 3D. Just imagine the neck strain of having the weight of an iPhone resting on the bridge of your nose for an extended period of time, not to mention the eyestrain. I wonder if this patent application entered the system on April 1, or maybe Navin Johnson is now an Apple engineer. Apple has filed a patent application for electronic video spectacles that will allow wearers to watch films in 3D on the inside of the glasses. Fans have already nicknamed the gadget iSpecs. According to the patent application (number 20100079356) the images would be equivalent to high definition in quality, and sensors inside the spectacles would detect the precise location of the wearer’s eyes to ensure the image is projected at exactly the right place and is comfortable to watch. This image is great. For the life of me I remain astounded by the success of the iPod/iTunes. I understand the branding quick-to-market aspects, but the iPod is a terrible tech device and standard. Ridiculous proprietary files, a history of just crippling DRM and many, many, many better and less expensive options out there. I know multiple people who lost massive collections of iTunes music because of the non-consumer/non-user friendly backbone of the service.